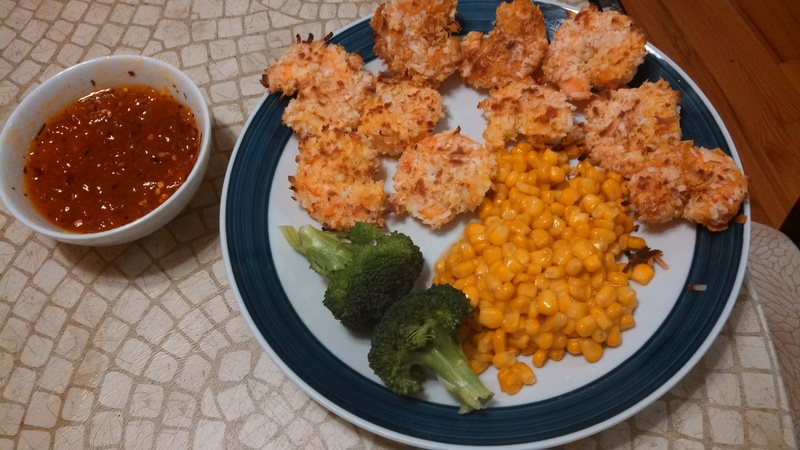 Coconut shrimp is not a dish you usually think of as skinny, but you can make it that way thanks to Skinnytaste. This recipe serves 8 assuming 3 shrimp and 1 TBSP of the sauce with the following stats: 162 calories/ 3.4 g fat/ 10.2 g protein/ 15.7 g sugar. Now we had this for dinner (with a little bit of leftovers) not as an app yet the shrimp portion still came out to around 400 calories each which would not happen in a restaurant setting, my friends. I will say we were approaching the sinner meal line since I made us our own individual dipping sauce bowls and the apricot preserves were not of the sugar-free persuasion. I indulged and maybe you’ll decide to as well. Blanket statement of caution: dipping sauces, dressings, and other ancillary items like cheese, nuts, etc. can take your caloric intake to new levels in your meal. It’s like those people who don’t count drink calories when they’re dieting. When you’re banging out 2-3 margaritas at happy hour and wondering why the lbs aren’t falling off, consider looking at the “nutrition” facts on one of those bad boys. Point being the that extras do matter if you’re not moderate about them. No judgement here- I am the same girl who made my own dipping sauce bowl for this recipe after all- just a tip to be mindful of whether you’re eating out or cooking in! Enjoy this shrimp recipe that I’m so happy I stumbled upon. Preheat oven to 350 degrees. Position one of your racks in the middle of the oven. Spray a non-stick baking sheet with cooking spray. Combine coconut flakes, panko bread crumbs, and salt in a bowl. 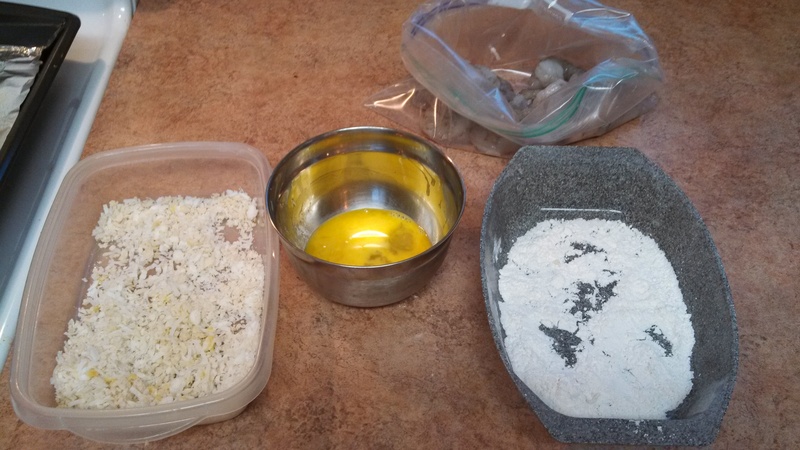 Place flour in a small dish. Whisk egg in yet another dish. Lightly season shrimp with salt (I threw them in a large ziplock bag, added the salt, and gave it a great shake to distribute evenly). Dip shrimp in the flour shaking off the excess, then into the egg, and finally into the coconut crumb mixture. 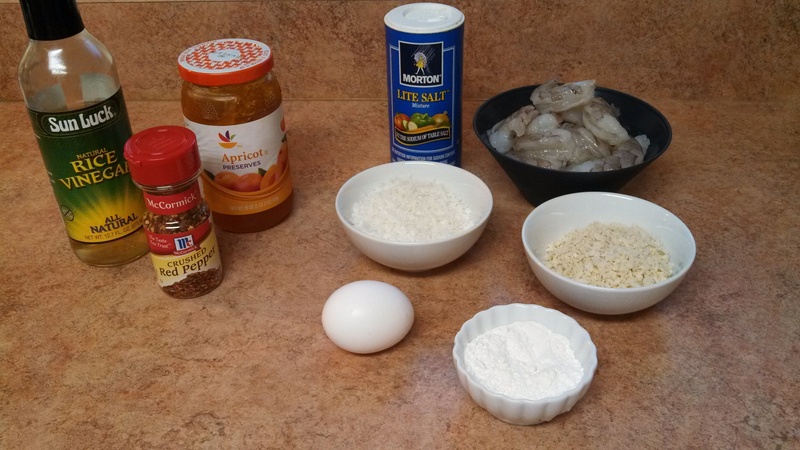 Lay shrimp on the cookie sheet and spray the top of the shrimp once more with cooking spray. Bake on the middle rack for 10 minutes. Meanwhile, combine all of the sauce ingredients in a small bowl. Turn shrimp over after the first 1o minutes and continue cooking for 6-7 minutes or until thoroughly cooked. Remove from oven and serve with dipping sauce.